Yogis try to see the changing or the rising and falling of phenomena. But this is not important – what is important is that your mind must be purified from defilements. That is more important. If the mind is ready, whatever experience comes, the yogi can understand. That is why I never ask yogis to see the rising and falling of phenomena; this is wisdom nature, not personal nature. Rather, take care of the quality of your mind; build up your strength. Because when the mind is ready, everything becomes Dhamma. Knowing how and why we practice is very important; it is important to understand why we need to practice in our daily life. Without practice, our mind quality is messy. And when our mind is messy, our life is also messy. That’s it. If our mind quality becomes better and better, then our life becomes a better life. Our life depends on the quality of our mind - the quality of our life depends on the quality of our mind. So, when we take care of the quality of our mind, our life becomes better and better, becomes more meaningful and skillful. Our life is full of problems because we are unskillful. Yogis want to see impermanence, but if your mind is not ready yet, you cannot. When your mind becomes stronger and stronger, naturally, you can see. Yogis think that Anicca is the rising and passing away of phenomena and they try to see rising and passing away. Actually, in nature sometimes you can see something new - new, new is also the same, no need to see rising and passing away. Sometimes the mind understands that the first and second objects are different, that they are not the same; and sometimes new, new, new object. It is the same, nature is the same; you don’t need to try to see rising and passing away all the time. Don’t simply believe your thoughts. You need to check the motivation behind the thought – it could be something wholesome or otherwise. Only you can know for yourself by checking. Wisdom has patience; greed has none. We think we are meditating very well, but not so when we are just enjoying the peace. When aversion comes, the mind wakes up. How is wisdom working? To meditate well, awareness and wisdom must be working together. Recognizing what is happening in the present moment, again and again, and slowly the mind can think in the right way. When there is some difficulty, it makes the mind more awake. Sometimes, I do this – when the mind is only peaceful and there is not much wisdom, previously I would ask myself: Are you aware, are you aware, are you aware? And later, the mind asks: What do you learn from this? And then, the mind becomes more awake. The question is just to wake up the mind, not for getting an answer. Just to get wisdom working. When the mind is neutral, calm and peaceful, yogis just enjoy the peacefulness, and learning stops. But if you can see the meditating mind, the mind quality cannot drop, but continues to be stronger and stronger. Every time the mind recognizes the awareness, the awareness becomes stronger and stronger. You need to prove from your experience whether nature is real or not. Is pain really nature? Then, you need to practice continuously. If you stop, then you cannot learn anymore. If you want to learn, you must go through the experience. This is not your understanding yet, it is second hand knowledge. It is other people’s understanding, the Buddha’s understanding and what we have read; but this is only at the intellectual level. We need deeper experiential understanding. That’s why we watch reaction and pain, reaction and pain repeatedly. Then sometimes when there is no reaction, when the mind is pure, then we can watch the pain and understand what it is. When the mind calms down, it is not finished yet; that is the time when it is ready to face the pain; at that time you need to learn what pain is? At that time the mind is ready, wisdom can arise, no anger anymore. There was a beautiful bouquet of flowers just beside the SOM Dhamma hall. One day, I sat on my chair in the hall and looked at the flower. I wasn’t meditating at that time, but it was obvious to the mind that seeing and thinking were very different. Flower is in the seeing process and the mind thinks ‘beautiful’. Then I realize that the flower is not beautiful. The mind is thinking ‘beautiful’. Flower cannot be beautiful, flower is just seeing process. Because of the habit of noticing seeing and looking, understanding can arise anywhere. Every time we’re looking and paying attention, awareness will be there if we make it a habit to notice seeing and looking. I encourage yogis to be aware of seeing and looking because we look and see all the time. Because you are aware, joy arises; this is also cause and effect. Because you are aware – this wholesome quality is working – then piti must arise. When you’re enjoying the piti, you must be aware of it. If you’re not aware, the enjoying mind becomes deluded. When delusion arises, then the mind changes direction to defilement. So, awareness must be there. If awareness is not present, then delusion is there. If delusion is present, any defilement can arise. Try to be aware that the mind is enjoying; not simply enjoy. Joy can arise naturally, but you’re not trying to enjoy this happiness; know the happiness. That is wiser. Delusion is like this: what it does before, it wants to do it the same way again, and again. But now we try to change, we try to understand more. When there is more understanding, we have more choices; we can choose a different way, a more beneficial way. Otherwise, if we don’t have enough understanding, we have no choice and we suffer again, and again. That’s why we are learning. What is reality, what is happening, and we try to practice and try to understand our mental state first – how the mind is doing, how the mind is paying attention, how the mind is feeling; any situation comes, how the mind reacts. And slowly, we learn from this. When you’re aware and defilements decrease, how much relief does the mind feel? If you know, then you will understand the value of the practice. Then only the mind is willing to practice all the time – because you understand the value of the practice. Yogi: First day, the mind notices continuous sad and worrying thoughts throughout the whole day. They couldn’t be controlled. On the second day, when the mind notices the thoughts, the thoughts could stop. Sayadaw: You’re not supposed to be controlling the result of what you notice; not trying to make it stay or disappear. The objective is to know with the right view and the right attitude. And the right view is to know that this is the mind, this is nature; and with that view you continue to know what is happening as it is. So, it doesn’t matter whether what you know (the experience) continues or stops. Sayadaw: In both days, you were aware of what was happening. Therefore what you’re doing was right; you were growing the awareness and that is what you want to do. Whether the mind is calm or not is not your choice. When the conditions for the mind to be calm are there, the mind will be calm. When you say that you cannot watch when the mind is not calm, you’re actually saying that you want the mind to be calm. You want it to be calm so that you can watch in a calm way, but in fact watching is already happening; you’re not satisfied to be just knowing. You don’t like defilements, but disliking is already wrong. You need to understand that defilements are also Dhamma. Akusala (unwholeseome) is dhamma, so why don’t you want to be interested in akusala? Akusala is so interesting; because you don’t know about akusala that’s why akusala can overwhelm your mind. Try to be interested in akusala; it’s nature. Then slowly you can understand what suffering is. You are suffering because you don’t know what is suffering. When you understand suffering, then you’re free from suffering. So, face and watch the defilements and learn. People only like kusala (wholesome) and don’t like akusala. 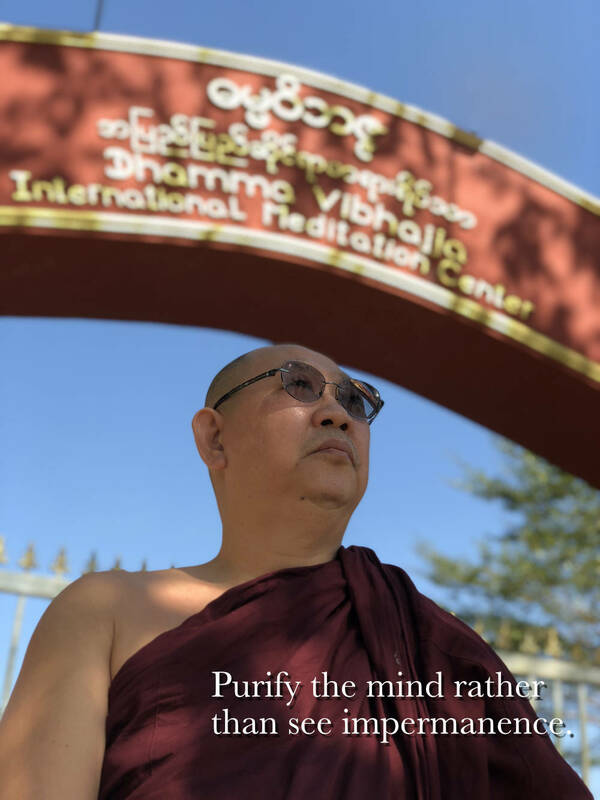 This is not Dhamma; you want everything to be perfect; this is not Dhamma mind. Don’t try to get rid of concepts; rather understand the difference between concept and reality/nature. The mind creates concepts – this is also reality. Yogi: When I see or hear something, I just notice seeing and hearing. I don’t think that it is a dog or bird. Sayadaw: Intentionally, you’re not thinking, but the mind already knows the concepts – that it’s a dog or a bird. There are 2 types of objects: nature/reality and concepts. You’re not trying to get rid of concepts; you should not get rid of concepts. Concepts are also a function of the mind; it is sañña (perception) working. The mind knows both concepts and nature; and you can understand that this is nature, this is concept. From what are seen (sights), the mind starts to create concepts. You should know that the mind is creating concepts; this is also reality.